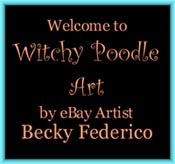 Witchy Poodle Artist: I've Changed My Animal-Artwork eBay Name! 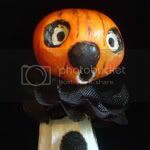 I've changed my eBay name Animal-Artwork-by-Federico to Poodelicious-Artwork-by-Federico. 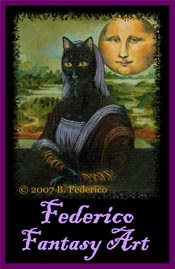 All CAT art will be offered under Federico-Fantasy-Art and I'll be offering only POODLE art under the new name. Click on my new logo in this post and it will bring you to my Poodelicious eBay Store. 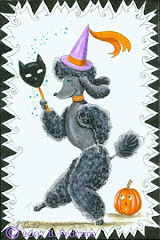 More whimsical Poodle artwork will be listed in the near future, including Poodle Parody Paintings. Hi Becky, I wish you GRAND LUCK & GREAT WISHES for your new Poodelicious-Artwork-by-Federico name & renames!!! Wow, what a changearoonie for you, congrats!! I just love the new name.. it's so.. dogelicious! 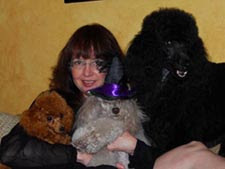 We love our fur friends don't we? I look forward to seeing lots of perfectly precious poodelicious art! Have a fabulous New Year's Eve, and be safe. Thanks so much for your sweet comments :). Love the new name Becky! Looking forward to your 2008 creations. Much success to you in the new year! May your 2008 be a BIG HIT! !